Sixty years ago today, the Milwaukee Braves were playing the New York Giants in an afternoon game at their brand-new County Stadium. The ballpark was originally built for the Brewers to use while the city lured a major league team, but had been so successful that the latter happened before the former could. The once densely populated 8th and Chambers Borchert Field is now just a memory. What some of baseball's greatest fence busters couldn't do has been done by wrecking crews during the last few months and today this picture shows all that is left of the diamond where minor league greats performed for decades. Milwaukee is major league now and the hub of activities is the new Milwaukee Stadium. The good burghers who for years kept their windows screened to protect against flying baseballs can now breathe easier. And with the cheers of thousands no longer ringing in their ears they can probably sleep better, too. At the time the old park was being torn down, the city didn't quite know what it was going to do with its newly-aquired, newly-empty full city block. Until just a few months before, Borchert Field and the land it stood on had been owned by Idabel Borchert, widow of prominent Milwaukee sportsman and former Brewer owner Otto Borchert, who (with some partners he later bought out) had purchased the Brewers in January of 1920: land, ballpark and all. When Otto died on the eve of the 1927 season, she sold the team but hung on to the real estate. 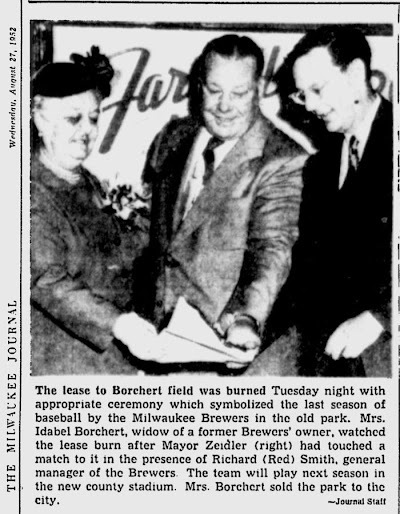 Mrs. Borchert owned the park through the various changes of Brewer ownership, from Phil Ball of the St. Louis Browns to Bill Veeck to the Boston Braves and more in between. All the while, the namesake's widow remained landlady to the Brews, who had them signed to a lease through 1954. The ashes were "placed in a recepticle and hauled away in a horse drawn hearse to the accompaniment of doleful organ music." At the end of the ceremony, the entire crowd stood to sing "Auld Lang Syne" on the imminent passing of the wooden park. A special committee of city, county and school board officials (...) favored keeping Borchert Field, former home of the Milwaukee Brewers baseball team, an open area for a playground or park until final plans are decided for the north leg of the city expressway system. The sound of cheering crowds and the sharp crack of baseballs off bats have been given way to the din of freeway traffic in the block bounded by N. 7th, N. 8th, W. Chambers and W. Burleigh sts. 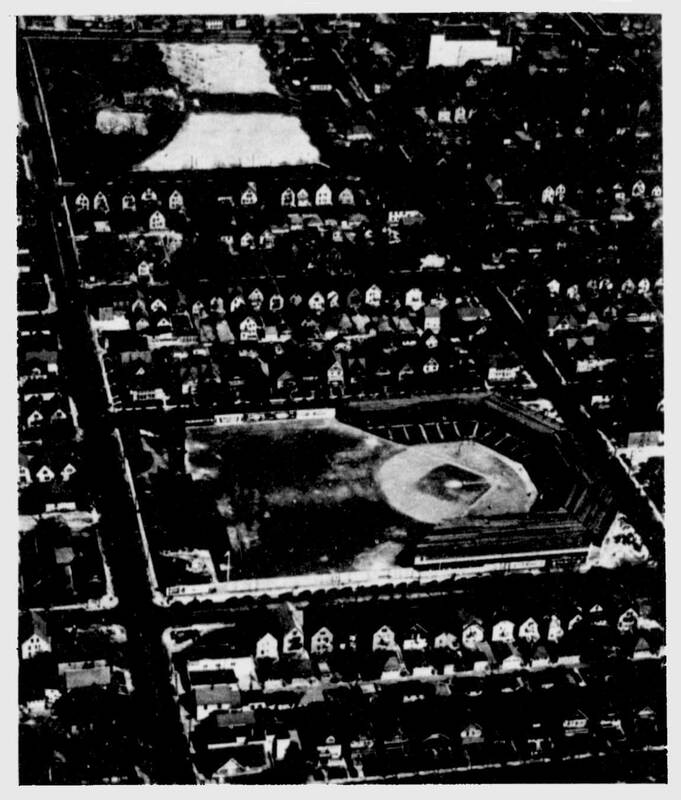 In 1928 the block was the site of Borchert field (lower), home of the old Milwaukee Brewers baseball club. Today the grandstand is gone (upper), replaced by the twin concrete ribbons of the North-South freeway. W. Chambers st. has been cut by the freeway. 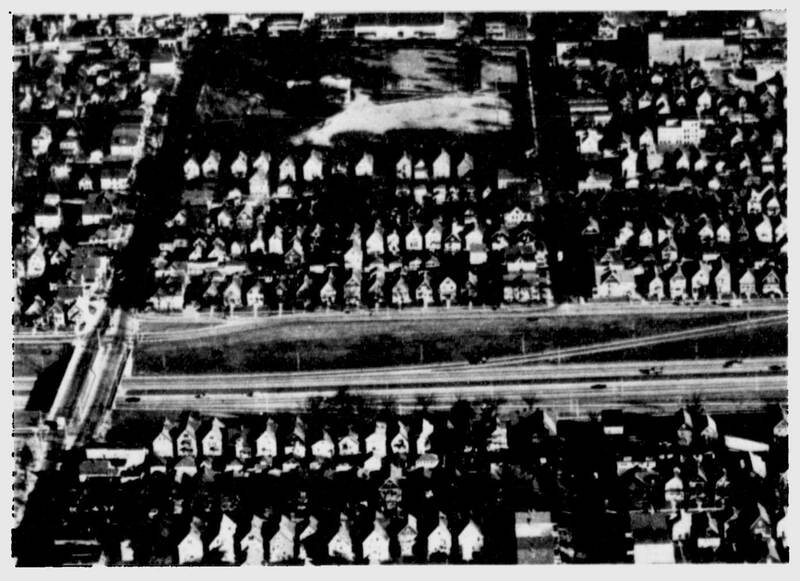 In the background of both of the pictures is Garfield park (upper left). 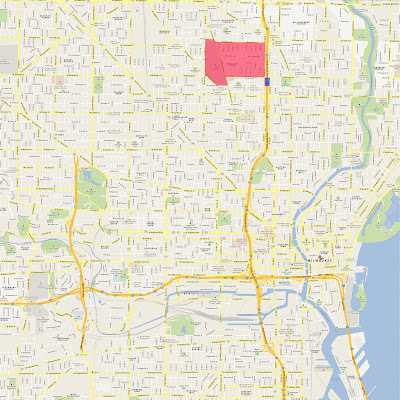 Garfield Park was renamed Clinton Rose Park in the late 1970s upon the passing of the district's County Supervisor, Clinton Rose. That park, two blocks east of the Borchert Field site, is where the Orchard's historical marker was placed in 2008. 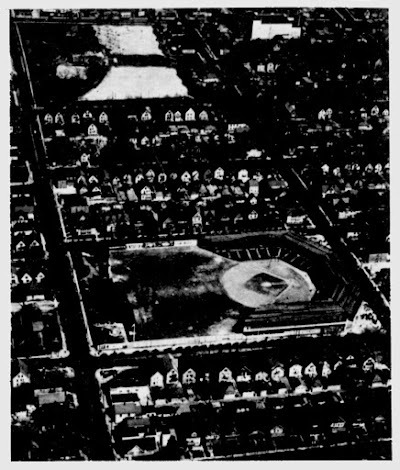 The irony is that by the time these two pictures were published in the Journal, the Braves had skipped town and Milwaukee was left without a big league team, the whole raison d'être for tearing down the old ballpark in the first place. Bud Selig was already hot on the trail of a new club, and almost exactly three years later Milwaukee would be home to a brand new (if somewhat improvised) Brewers, carrying on the Orchard's traditions. 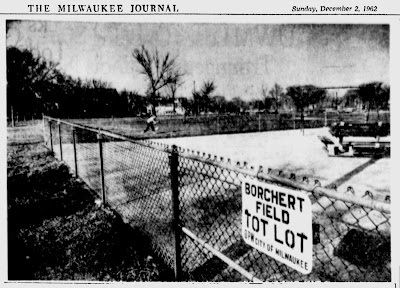 Today, the name "Borchert Field" lingers on as one of Milwaukee's many colorfully-named neighborhoods, like Brewers' Hill, Tippecanoe and Walker's Point. Curiously, the old ballpark site itself does not appear to fall within the boundaries of this neighborhood, which from what I can find online reaches as far southeast as Burleigh and Eighth, or kitty-corner from where the ballpark used to be. 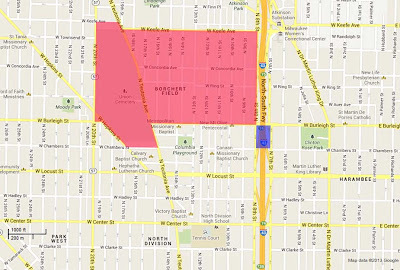 The "Borchert Field" neighborhood is in red, the site of old Borchert Field itself in blue. Milwaukee's baseball past lives on, sometimes in subtle ways. Uni Watch - "The Spirit of '48"